What an enriching and joyful process it’s been going through pictures spanning my dad’s whole life and reading the cards and online condolences through which people described him based on the context within which they knew him best. Over the past two weeks, this process has helped me to see him in a much greater context above and beyond the particular relationship I had with him—which also differed from the relationship either of my siblings had with him. Every relationship is unique, and every life is composed of different relationships and chapters through which we express ourselves in different ways, much like a multifaceted crystal that is held to the light and turned to see the different angles from which the light shines through it. And yet, there are some qualities that remain more or less consistent at the core. I remember being at his USAirways retirement celebration about 15 years ago, which provided me with my first glimpse of who he was in a broader context, beyond just “my dad.” When it was his turn to speak, he was quite a storyteller. And funny! I’d never experienced that side of him before! Those were some of the traits that endeared him to so many. He also could be stubborn, and that’s a side I saw a lot. As he was in the hospital on what would be his deathbed, I commented to my son about how stubborn he was being as we left ICU one day. His “stubbornness” seemed to frustrate me more than anyone else and usually had something to do with him not being receptive to my ideas and how I was trying to help him. Holding tightly to previously established preferences and opinions. But my son suggested that he was dignified, rather than stubborn. My dad was determined to do things his way. A true Taurus! He loved his hot dogs and ice cream and refused to follow a diabetic diet. He refused to have a fistula put in his arm in preparation for the increasingly likely event of kidney failure and a regimen of dialysis to keep him alive. He wanted nothing to do with a life without hot dogs or a life centered around time-consuming dialysis treatments and not being able to go to the YMCA to exercise and socialize. This summer, whenever he told me he had a hot dog for dinner or that friends brought him one or two when they visited him, my heart smiled because I understood my dad was an old dog who wasn’t about to learn new tricks and that he was choosing quality of life over longevity. His quality of life took a great blow when my mom died, and wherever he could find moments of happiness and comfort…was good, in my opinion. One day back in February 2013, he was exercising at the YMCA and went into cardiac arrest. When I was on my way to the hospital with my mom, all we knew was that they used the defibrillator to get his heart started again, but it was very shaky. We didn’t know if we would arrive at the hospital to find him alive or dead. When we arrived, he was in the care of one of my best childhood friends, and we were able to talk to him. He was about to be transported to another hospital, and again, we didn’t know if he would survive the ambulance ride. But when we arrived at Albany Medical Center, he was alive and in good hands. He ended up surviving quadruple bypass surgery. Our family is so grateful for the YMCA staff, who gave us an extra 3 ½ years with him. For some reason, it wasn’t his time then. Always one to look for meaning, I often contemplated why my dad didn’t die that day. What was he still here on earth to learn, experience, or do? At the time of my dad’s cardiac episode, we had no idea that my mom had pancreatic cancer. She was diagnosed with stage four pancreatic cancer by the end of the year and passed away within six months of being diagnosed. But in between my dad’s cardiac episode and my mom’s death, they were able to celebrate their 50th wedding anniversary together at Disney World. Losing his wife of 50 years – his best friend and soulmate – was so hard on my dad, and I’m sure that was obvious to everyone who knew him. His life would never be the same. Yet, I believe she needed to leave when she did so he could experience some things and grow in ways he wouldn’t have been able to grow otherwise. For example, he had a more direct relationship with my siblings and me when our extroverted mom wasn’t in the picture doing most of the communicating. And I think that was really important for him and for us. We had nearly 2 ½ years to do that. During that time, he was able to meet his first great-grandchild (my granddaughter) and see his grandson (my son) graduate from high school. Two weeks before my dad finally went to the doctor for foot pain that kept getting worse this summer, a friend contacted me late at night to tell me that he walked past a particular music venue and saw my dad sitting in there alone. I reminded him that’s where my parents used to go to listen to music and added that my mom is probably there with him in spirit. My friend replied that my dad looked really sad, and I said it’s because he doesn’t realize she’s there with him. Understanding how difficult and painful it was for my dad to walk, I was surprised he went through the trouble of finding parking in downtown Saratoga Springs during the busy, summer tourist season and walking to the venue. He must have had a strong purpose or longing to go there. Things aren’t always what they seem. Sometimes what seems to be a cruel twist of fate is merciful. We just can’t see the whole picture from where we stand. A diabetic with significant cardiac history, my dad had a rough summer that included six-hour bypass surgery to correct a circulation issue in his leg. That was followed by a recovery period, and in the midst of recovering, he ended up back in the hospital for a sore on his foot that resulted in his little toe being amputated and another recovery period. After being discharged from the hospital, he spent a couple of weeks at a rehab center and in less than a week after being discharged from the rehab center came down with the pneumonia that claimed his life. During the last few weeks of his life, I worried about how my siblings (one local, one not) and I would care for our dad when he got out of rehab and was being his stubborn or willful or dignified self. Like when my dad and I came back inside after our first wheelchair excursion outside of the rehab center on a beautiful day, I dashed into the restroom for about 15 seconds, only to find him wheeling himself down the hallway toward the main entrance when I reemerged. A custodian witnessed it and had a look of combined shock and amusement on her face. I felt like the parent of a toddler, who must be ever-vigilant. It was a strange feeling to have in relation to my dad. I became anxious about how he would fare living on his own in his split-level house with stairs all over the place. On the way home from rehab, I reminded him that there was a walker on each level of the house that he was supposed to use, and he exclaimed that he wasn’t going to use any walkers and then took off like a racehorse when we arrived home. Again, I felt like an anxious parent trying to get him to follow doctor’s orders that he claimed he never remembered hearing. How could I help him when he wouldn’t do what he was supposed to do? I wondered how long this would go on, how long he would need a caregiver at the house, and whether he would need to go into a long-term care facility at some point. But throughout this time, I kept hearing my mom’s voice in my head assuring me: Don’t worry. This isn’t going to take long. I wasn’t sure exactly what that meant, but two days before he died, when he was back in the hospital being treated for pneumonia and congestive heart failure, I found a dead cardinal in my driveway. I’d never seen a dead cardinal before, and my dad loved cardinals. When I saw the cardinal, I had a sinking feeling that he was not going to make it this time. And although my mortal heart was breaking, my intuition assured me that it’s okay because it’s his time. My dad would not have wanted to live a life in which his freedom was restricted. In the end, it seems his swift death was merciful. He didn’t have to languish in a nursing home or undergo dialysis. He didn’t have to observe another wedding anniversary without his beloved wife and passed on in time to spend their October 19th anniversary together in spirit. As much as I will miss my dad, I realize that losing our parents is part of the natural course of human life. In recent years, some of my friends have had to face the tragedy of losing a child, and a couple of my kindergarten students suffered the sudden loss of a parent. I have not lost a child, and I am not a child who has lost a parent. What I am experiencing is within the natural cycle of life. It is to be expected. My parents loved each other so much, and although he kept going the best he could, my dad’s life would never be the same again after losing my mom. With a love like that, it’s not unusual for the surviving spouse to follow close behind. So I really feel it was my dad’s time to go. In the end, pneumonia wasn’t a thief that came along and stole him from us before his time. It was a swift, merciful ride to the other side that saved him from declining health, a restricted lifestyle, and continued mourning. That he was able to avoid that kind of pain and suffering brings me peace. © 2016 Susan Meyer. All rights reserved. To use any or all of this article, include this exactly: Susan Meyer (SusanTaraMeyer.com) is a photographer, writer, clutter coach, feng shui consultant, and mindfulness teacher whose work is infused with a deep interest in the nature of mind and appreciation of the natural world. She lives on the Hudson River in Upstate New York. It is with sadness that I write about my dad’s passing eight days ago. He succumbed to pneumonia Legionnaire’s Disease (we learned later) after being in ICU for five days. He died less than two-and-a-half years after my mom died of pancreatic cancer, which isn’t unusual for couples who love each other greatly. As difficult as it is to lose my dad, for many reasons (that I will share in a separate post), I feel it was his time, and that certainty brings me peace. We had his calling hours and memorial service yesterday at his church – the culmination of a week of tremendous activity. There were many meetings and lots of work involved in creating a video slideshow for the church events and working around numerous, unprecedented technical glitches that arose. I went through boxes of my parents’ photos to assemble photo collages to display in large frames on easels. Wrote a eulogy. Found a new, loving home for his cat. Visited with my two adult children and nine-month-old granddaughter, who traveled from out-of-town. In other words, I attended to the usual tasks that fall on the closest relatives immediately after someone dies. But I also did something not so common in our culture: On Tuesday, I drove to Bennington, Vermont to be present for my dad’s cremation, as I did when my mom passed away. And that might sound morbid, but it wasn’t. It was transcendent. I was not with my dad when he passed away. I couldn’t make it to the hospital in time but was able to say goodbye to him over the phone. I told him that I love him and thanked him for being such a great dad. I encouraged him to let go and assured him that everything is going to be fine. We are going to be fine, and so is he, for he is about to go on a wondrous journey. I told him I’m so happy for him because he will soon be with my mom, his beloved wife of 50 years. His last words to me were: I love you, too. I couldn’t be there when he died, but I was able to show up for his cremation, which felt like another part of the process to witness with love, light, and presence. When my mom died, I pushed her cardboard coffin into the crematory retort and then retreated to my car to meditate for a while before walking around Bennington for a few hours until her cremains were ready to be picked up. But with my dad, it was different. The funeral director invited me to come and go as I pleased. He left the crematory door unlocked and placed a chair next to the retort for me, along with two bottles of water. I sat next to the crematory retort for an hour and a half meditating on my relationship with my dad. I remembered good times and reflected on all the ways in which he expressed his love. The small but meaningful gestures, such as vacuuming my car, filling my gas tank, and taking us out for dinner. And larger gestures, such as when he helped me out financially when I needed an implant for my front tooth and when I was getting divorced. How he and my mom made it possible for me to attend the private college I felt so drawn to, without having to take on much student debt. The family vacations that usually involved amusement parks, such as Disney World. How he always had my back and conducted himself in such a kind and dignified manner, which made me proud to call him my dad. I also visualized any sadness, grudges, regrets, and human weaknesses and impurities burning away until only love and light remained. Until only spirit remained, released from any human shortcomings – his or my own. That included any negative feelings or resentments I harbored because, at the personality level, my dad and I were so different, and I challenged and disappointed him in many ways. He was a traditionalist with a worldview that was much more conservative and black-and-white than my own, and through the years I came to accept that rather than try to change him or get him to understand my worldview and choices. For instance, when I got married, I wouldn’t let my dad give me away because I did not consider myself an object to be transferred from one man to another. I’m sure that all the explaining in the world couldn’t help him understand that because, with my dad, you didn’t question tradition. You just followed it. So I let all that burn away until only love and forgiveness (for him and for myself) remained. I sat there and told him everything I wasn’t able to express when he was alive. Sometimes we don’t recognize the different ways in which people express love in the best way they know how. We might not realize that the questions and comments that seem so judgmental on the surface arise from a spirit of deep love and concern. Our communications pass through our human filters and so often get misinterpreted. And we build walls to protect our fragile egos. And we build histories, stories, and communication patterns that are often so hard to rise above. And we don’t say what is in our heart because the patterns are so entrenched. That’s what I got in touch with in the crematory and allowed to burn away. I bathed all that in love, and it transformed into nothing but love. I recalled the scared look in my dad’s eyes during the last few days of his life because he sensed something was different this time. How he absolutely refused to engage in a conversation I initiated about hospice care, and it felt like just another example of him rejecting what I had to offer based on my knowledge, experience, values, and sincere caring. How I couldn’t be there when he died because I needed some distance from a situation that arose, in order to maintain my strength and sanity. How I felt I could support him better from a distance that last day of his life, not knowing it would be his last day. I let all that burn away until only love, forgiveness, and an appreciative sense of humor remained. I essentially composed his eulogy (which I will share in a separate post) while sitting in the crematory. The tears I cried were mostly tears of appreciation and gratitude for all the ways in which he expressed his love and continued to love and care for me, despite our differences. I appreciated what a steadfast provider he was for our family and for having such a stable, secure childhood. I appreciated the ways in which his traditional worldview was challenged to the core by some curveballs life threw his way and how he responded with love every single time. I appreciated how much he and my mom loved each other. 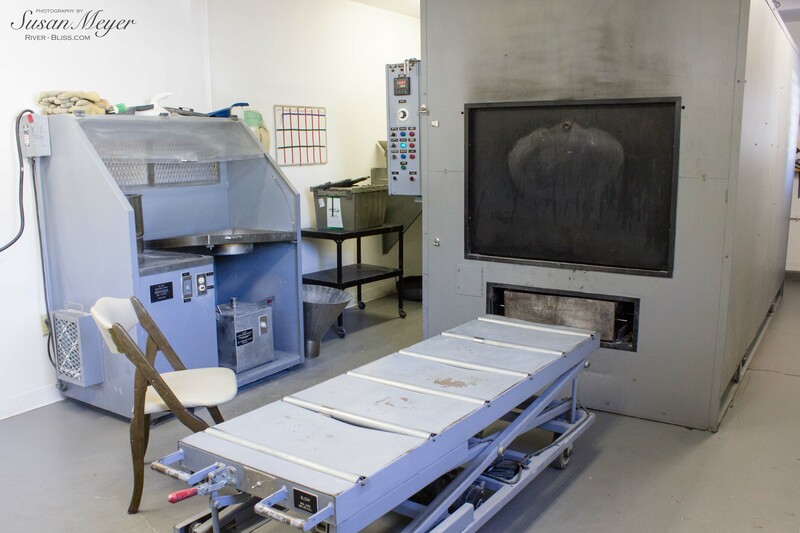 As my dad’s body burned in the crematory retort next to me, I reflected on all the ways in which he expressed love for us, acknowledged our relationship and humanness, and honored the spirit that unites us. The spirit of love and kindness. It was a powerful process, though not one that many in our culture choose to experience or even realize is possible. By the time I left the crematorium, I felt so light and filled with love and light and appreciation for my father. I felt his light shining so brightly. I am not the pieces of the brokenness inside…I am light. I am not the mistakes that I have made or any of the things that caused me pain…I am light. I am not the color of my eyes, I am not the skin on the outside…My soul inside is all light. While waiting to hear that my dad’s cremains were ready to be picked up, I drove around and decided to take a walk before dark. I ended up in Old Bennington and couldn’t resist parking near an old church with an adjacent cemetery. It seemed like a perfect place to walk with my camera. Not knowing anything about the history or looking for anything in particular, my intuition led me through the cemetery, and I came upon poet Robert Frost’s grave. How perfect, I thought, for that day I took the road less traveled, and it made all the difference. There are many cultures in which funeral rituals, including cremation, are not performed by professionals out of sight of grieving family and friends. The image of open cremations on the banks of the Ganges in Varanasi, India comes to mind. Families gathered around the funeral pyre watching the body burn, coming to terms with mortality and relationships. What do we gain by keeping the care of our dead at arm’s length? What do we lose? Being present for my dad’s cremation was such a positive, healing experience for me. I wish it were more commonplace in our culture…even as I see my dad in my mind, bristling and shaking his head, wondering how on earth I could think that way. Knowing he’ll never be able to understand me but loving me just the same. Earlier this week, the vascular surgeon said it would be a wild ride, and has it ever been! I spent a couple days this week crying and rebelling against my current realities and have the puffy eyes to prove it. This week has been exhausting. Illuminating. Clarifying. And so much else. But today is a new day, and I have quite a story to share. One I hope you will find inspiring. My dad underwent emergency bypass surgery two days ago to fix a severe blockage in his leg so he wouldn’t lose his foot. It was no simple procedure, given all his medical issues. I stayed with him in pre-op, and when it was time to leave, I looked in his eyes and saw how frightened he was – of losing his leg or worse. I assured him that he was in good hands and had the easy part because he’d be out the whole time, and as far as he’s concerned, I’d see him in about two minutes, post op. I held his hand, told him I love him, gave him a kiss, and left the hospital with his wedding ring in my possession and my mother’s voice in my head telling me that I am a good daughter and that everything will be alright. Hearing her voice brought tears to my eyes. Remote mothering, but mothering, nonetheless. Two family members have had “very real” and vivid dreams of her in the past two weeks convincing them that she is still around and watching over us. That was the first time he had ever dreamed of her or experienced a dream that felt “so real”. The same was true for my daughter, who dreamed my mom came back one more time and told her that she’s been watching over her and is aware that she has a daughter and really wished she could meet her but wasn’t able to. I haven’t had such a “dream” in a while but have been hearing my mom’s voice in my head quite often. It is the most loving, compassionate voice. Maybe it’s actually my own voice growing stronger, but it sounds like her, and I’m grateful to hear it. He was in the operating room for six hours. And what a journey those six hours were! Understanding that the surgery would be quite complicated, I left the hospital in a bit of a daze. While he was on the operating table, I felt like an orphan. I felt so lonely and drove around longing for a warm hug and a few kind words. I parked my car, and when I got out, there was a single white feather on the ground right next to the car door. I associate white feathers with deceased loved ones, so I immediately thought of my mom and felt her love. I cried a lot over the next six hours. And reflected. Heightened, ultra-real moments, such as when you’re waiting for a loved one to come out of surgery, carry a special power to cut through illusions, break spells, and offer the gift of clarity. I was able to see more clearly what was most important, what was missing, and what needed to change in my life. I realized that for a long time, in some ways I had only been seeing what I wanted to see, not what was really going on. It was like when I accompanied my parents to my mom’s oncologist appointments, and when we left the doctor’s office, they agreed cheerfully that the news the doctor gave them was hopeful – though I heard something entirely different. And when my dad managed to convince himself the day before his surgery that the vascular surgeon didn’t really intend to give him a bypass the next day even though she stated it clearly and gave him instructions to prepare for it. It’s like when someone tells you they love you, and you want to believe the words rather than the actions, which indicate otherwise. Hindsight may be 20/20, but when clarity emerges – even if it brings somber revelations – it is always a blessing because at least you know what you have to work with and can move forward, blinders finally removed. Even after my dad’s surgery was successful, I continued to cry for virtually the entire next day because what I realized in those hours of clarity was hard to bear. And I hadn’t gotten enough sleep, which never helps matters. All I could feel was the pain of the great void of loss that felt like it was growing and threatening to consume me. I missed my mom terribly and wished my arms were long enough to pull her back from wherever she is. Even if she really is closer than we realize, it wasn’t close enough. My mom and grandmother are gone. My son will leave for college in two weeks. My daughter and granddaughter have moved to Georgia. That’s a lot of empty space that used to be filled with activity and face-to-face interaction with loved ones! So yesterday was Crying Day – I Miss My Mom Day – from start to finish. But when I went kayaking in the morning, there were white feathers scattered all over the river for as far as I paddled! This morning, I opened my eyes and was called to the dock by the colors of the sunrise. I sat on the dock listening to the cicadas, crickets, and birds and feeling the cool, morning air on my skin as a single dragonfly zipped around, and the sunrise colors developed. After a day of crying and lashing out against all the empty spaces in my life, I was able to wake up in the morning and “be here now.” Be at peace with what is rather than vehemently oppose it. And that’s how I realize I will need to proceed: One mindful moment at a time. Focus on what I already have, rather than on what is missing. There have been too many goodbyes lately, and sometimes it feels overwhelming. But that’s life. People will come and go, often before we are ready to release them. And the spaces they leave behind can feel like vast, haunted caverns of sadness and loneliness. But in what feels like empty space, the Universe has created an opening that holds glorious, unlimited possibilities. Yes, there are some gaping spaces in my life – and perhaps in yours, as well. But there is also so much love and nourishment in our world if only we can look through the lens of the present moment and its wealth of possibilities rather than try to prolong the past. And embrace our wholeness! When we feel ourselves craving more or wanting something or someone out of our reach, we can take a deep breath and remember that we already have everything we need. Focus on that. The miracle of gratitude. My dad made it through his surgery. The sun rose again this morning, and the sunrise was quite beautiful. The water lilies floating on the river are irresistible, and the large clusters of Queen Anne’s lace give off a sweet, subtle fragrance. I am married to a man who is the personification of peace and love and who has transformed himself in ways I never imagined possible. My son is about to embark on the next, exciting chapter of his journey, and I can connect with my daughter and granddaughter via video calls. I have wonderful, healthy friends who have stepped forward and filled some of the empty spaces with empathy, caring, and wisdom. Their nourishing presence has helped me to make it through this week. So I offer this advice for you and for me: Accept the love and blessings that show up in your life. Focus on that. When someone hugs you, for instance, be present. Feel the loving, caring energy that is wrapping itself around you. Melt into it, and connect with that instead of ruminating on who or what is missing or what is causing you sadness. A mindful hug or conversation can transform your mood, your day, and even your life. And because I’ve done it myself and have witnessed others doing it, I ask us both to consider: How are you pushing away the love that wants to flow to you and then calling yourself lonely? Who is right there dancing with you even though you aren’t even aware of it? How does love want to enter your life? How can you open yourself to it? After my mom died and I had quit my job teaching kindergarten, my wise son realized I was feeling down and remarked that he thinks I need to find “something precious to care for.” After more goodbyes and empty spaces, I suspect that precious thing might be me. Because for so long, I have been busy caring for others: My children. My family. My young students. A troubled friend. As I sat on the dock this morning witnessing the sunrise, I realized that in the gaping emptiness, my book is waiting for me – the one I am going to publish once I finish writing it. A precious thing to care for. A glorious possibility! A new day. A new opportunity to integrate the lessons of yesterday into cultivating greater wisdom, kindness, and love and bringing our best selves into being. May we forgive ourselves and others for how we have fallen short. In other words, for being human. Each of us is a brilliant work in progress, and the possibilities are endless. The second anniversary of my mom’s death (or “angelversary”) has come and gone, and although it was a month ago, I want to write about it, to offer a message of hope…because I have found that the difference one year makes borders on miraculous. The first year was spent mostly recovering from the shock and coming to terms with her absence as the parade of birthdays, holidays, and other special occasions marched on. Year One was like one big, long noooooooo! I was acutely aware of the brevity of life and of everything that felt misaligned in mine. Her first angelversary – actually, the whole month of May 2015 – was brutal! It found me about as downhearted as I’ve ever been in my life, standing at the confluence where a year’s worth of grief, discontent, and confusion in different areas of life converged – for sometimes the tears from big losses give birth to tributaries of thought and action that lead to additional disillusionment, heartache, and letting go, thus complicating the process. The first year felt a little like my mom was away on vacation somewhere, but when the anniversary rolled around, it came with a sense of permanence. It had been a full year, and she wasn’t coming back. Still spinning from the realization, “Life is short, so do what you love,” the second year was a big time-out for soul-searching and letting go of what no longer seemed to fit. Big things, like leaving my teaching career (which, despite how long it took to muster up the courage, I haven’t regretted for a moment). I decluttered my house and my life to make space for new possibilities and did everything I could to build a foundation for new beginnings. Mercifully, there weren’t any more “first” holidays to get through – although the first member of our family’s newest generation was born in January. At the beginning of Year Three, my youngest child graduated from high school, and I anticipated that my mom’s absence would be felt at graduation. But it wasn’t so bad after all. I wore my necklace that contains some of her ashes and carried her with me in my heart – as I do every day. In Year Three, I feel ready to resume my life in earnest – albeit a different version than I was living a couple years ago. I have lightened my load, tried a lot of new things, and assumed some new roles. I still don’t know “what’s next” but am at peace with not knowing. I’ve always sensed there was some kind of divine hand involved in the events that transpired following the death of my mother and that important work was being done, no matter how bewildering it appeared on the surface. “Believe in the integrity and value of the jagged path,” advised Cheryl Strayed, author of Wild. Amen to that. Although I still miss my mom every single day, thank God her second angelversary was nothing like the first. On the actual anniversary, I took it easy. I walked the labyrinth just as I did the day she died, and it felt quite the same. The weather was the same, and feelings of loss and sadness lingered in the humid air. When I stepped out of my car, a bunch of purple irises greeted me, just as they did the day she died. As I walked the labyrinth, two young girls noticed a butterfly right next to my car, which reminded me of when my daughter told me she noticed the first butterfly of the year the day my mom died. I took a long walk and felt grateful for having such a wonderful mom in my life for as long as I did, for her voice that continues to echo inside my head and heart, for the dreams in which we are together again for a few awesome moments, and for the dear souls who have come into my life as a result of our shared grief. A couple days earlier, I’d found in my dad’s freezer the last remaining bags of strawberries my mom had picked. I visited my dad on the evening of my mom’s angelversary, and we enjoyed strawberry shortcake made with her hand-picked strawberries. As the sun set, I took another walk and felt strong and peaceful. Strong because now I can handle the grief that threatened to shatter me last year. I can handle my mom being gone, although I really miss talking with her (though sometimes we have conversations in dreams). It occurred to me that a year ago, I wanted nothing more than to feel the way I feel now, and I am immensely grateful for that. I wondered how long it would take to find my way out of the woods. Would it take that long? When it feels as if your grief will last forever, you have to realize it’s just an illusion, a trick of the light. Something is blocking you from seeing the greater picture and finding hope. Maybe it’s the belief that things should be different. Maybe they’re exactly as they need to be so you can awaken for your highest good. The image that comes to mind is a flower plant underneath an overcast sky in early spring, when winter refuses to relinquish its hold. After several gray days, it seems like the sun will never come out, and spring will never really arrive, and the flower wonders if it will just wither where it is, without having the opportunity to bloom. But the weather can change any moment. The clouds can shift enough for a beam of light to come through. The next day or even in a few hours, the clouds might give way to blue sky and warmer temperatures. You just have to know that it won’t be overcast and wintry forever and trust Divine Timing. Eventually, the clouds will break, the sun will come through, spring will overpower winter, and you will bloom. The wonderful secret is that growth was taking place all along, even when it felt like nothing was happening or that you were going backwards. My blooming moment was when I realized that what felt like it was going to destroy me and break my heart to pieces no longer felt so big. What a wonderful feeling! Moments of shock and sadness may still arise, but they don’t endure. I’ve found my mom’s voice inside my heart and have learned to look forward to when she appears in my dreams or there’s some kind of wild serendipity or “sign”. I really miss picking up the phone and talking with her. I miss her loving and exuberant energy and the unique light she beamed into this world. But as much as I still miss her physical presence, I feel more deeply connected with her essence. I’ve learned how to use my breath to breathe over the top of a wave of grief so as not to be overwhelmed by it. I’ve learned to be much more aware of my thoughts and to choose thoughts that are more positive and hopeful. And I’ve practiced leaning in to my feelings and learning what I can from them and watching them dissolve. I’ve learned to face my fears and release what no longer serves me, and to listen to the loving voice inside me that feels like my mom’s essence, or perhaps my Inner Mother, growing stronger. To know that whatever arises, this, too, shall pass. I’ve learned that on days when the wind picks up, and the waves are strong, it’s best to keep things as simple as possible, practice self-compassion and nourishment, and treat myself as my mom would want me to be treated. I’ve learned to cultivate the essence of what I lost, only to realize it was within me all along – and that what was taken from me is a part of me, so I can’t actually lose it in the first place. Now, when grief-waves arise, they don’t tend to last more than a minute or two. They still crash into me, but they don’t come as often as they did last year, and my recovery time is much quicker. A year later, there is much more space between the waves, and more often than not, when I think of my mom, it is with more gratitude and appreciation than sadness. There is a new a voice in my head and feeling in my heart, and when they arise, I feel closer than ever to my mom’s essence . Every now and then, it stuns me to realize that she died and that I will never see her again in this lifetime. It strikes me as the most inconceivable reality ever and sends a chill through me. So I have learned to lean in and sit with it, rather than resist or struggle against it. And then the feeling passes. It can’t feel that big for too long because you just can’t live like that! You learn to allow the bitter reality and to have a more accepting relationship with what is – even if only because arguing with reality only compromises your peace of mind and quality of life – and you finally get tired of suffering and decide there must be another way. And in the mercifully expanding spaces between the waves, peace enters in, and you learn the waves will pass. You learn how to let them pass right through you without holding on to them, losing your footing, or running away. You allow yourself to be touched by them, like a cool wave that crashes against your skin when you stand at the edge of the sea. And you learn that who you really are is so much bigger than any loss you can experience in this lifetime. The point is that the loss gets easier to bear in time. It doesn’t mean that love has gone anywhere or diminished. It just means you’re able to pass through to the other side and grow. And that’s actually quite wondrous. When someone leaves, holding on and carrying the weight of grief isn’t something we need to do in order to prove our love for them. There are so many other, less self-destructive ways to continue loving a person. But sometimes grief sets other dominoes in motion, and the waves get bigger until you become tired of suffering for real. And then an inner voice arises and asks: Do you really want to do this work? Do you really want to give up suffering? Do you want to transform your life into something higher? And if you answer yes, then you have to love yourself enough to break the habits that cause suffering, beginning with the thoughts you allow to take root in your mind. You realize you have a choice in the first place and choose thoughts that bring relief rather than suffering. Or at least, that’s the radical and empowering transformation my grief produced, and I am ever so grateful because it has set me free from so much more than grieving the loss of my mother. It applies to everything – which is some serious blooming. If you are grieving, please know that no matter how much it hurts now, you are going to find your way to the other side of this grief. I don’t know how or when, but time is your friend. For me, it’s been a jagged path, but whatever it takes, thank God for it because what I feel now is night and day from what I felt then. The anguish that came with the reality that I would never see my mom again in this life has evolved into feeling more connected with her than ever. Finding her anywhere. And sometimes jagged paths make the most interesting and inspiring stories. I’ve been living and writing mine for the past two years so far and feel certain that someday I’ll be able to place it within a context that will make more sense. But that time is not now. And that is okay. What Did She Say to the Flowers? For as long as I can remember – even as a young girl – my mother was a gardener. She wasn’t an outdoor person like I am, but she loved her gardens. For years after we moved out of the house where we spent the first 13 years of my life, whenever we’d drive by the old house, she’d wonder how her gardens were doing. Wherever she once had a garden was holy ground. My mom tended her flower gardens with great care until the final spring of her life, when she was too weak. I’m grateful she kept a garden because it presented me with a wonderful birthday gift yesterday, nearly two years after she passed on. Normally, the garden is buried beneath a blanket of snow on my birthday, but not this year. This year, the bare ground greeted me with tiny, purple flowers. What did she say to the flowers to awaken them from their winter slumber just in time for my birthday? And what made me notice the tiny, purple blooms after paying no attention to the garden since the parsley was overcome by frost last fall? Two years ago, as my mom withered from pancreatic cancer, there was no telling how long she’d stay alive. I hoped she’d at least be able to see the first flowers come up. I looked for any signs of them and began to share the “flower report” with her as soon as I noticed any indications, beginning with the first daffodil shoots outside my classroom windows. When she was too weak to walk around the neighborhood, I told her about the neighbors’ tulips, which meant hers would bloom soon, too. When she was too weak to walk around the yard, I photographed her perennials so she could see how they were coming along. Seeing pictures of flowers made her smile. We made the most of lilac season that year. I showed her pictures of the first buds on the lilac tree in my yard and hoped they would hurry up and bloom so she could experience them one last time…which she did. I kept her well stocked with lilacs that May – the last month of her life. I put them up to her nose so she could smell their sweet fragrance and kept vases of fresh lilacs close to her to lift her spirits. It was the best I could do. Now that she is without a human voice, she speaks to me through flowers – and music – because they are what she loved. To see the year’s first flowers in her garden on my birthday was no small thing. There’s a plaque in my mom’s garden that reads, “Love grows here.” It’s true. Love continues to grow, even after she has passed beyond this world. All the love she put into her garden carries on. So plant a garden, however you can, if you are so inclined. Plant a garden that will continue to bloom even after you are gone, and fill your loved ones’ hearts with gladness. One of my favorite quotes from Elisabeth Kubler-Ross is: “Should you shield the canyons from the windstorms, you would never see the true beauty of their carvings.” Similarly, Michelangelo claimed he saw the angel in the marble and carved until he set him free. The metaphor of carving and sculpting really speaks to me after receiving discouraging health news from a close loved one last week. Perhaps this is why I have experienced my departed mother’s spirit so active around me in recent weeks – most recently in a strong fragrance of lilacs that arose out of nowhere when I was walking outdoors in solitude and stopped for a moment to record an insight. And I have been hearing her loving voice in my mind more clearly than ever. I have no doubt that she is making her presence known to give me comfort and strength, not only for myself but also so I can source it for others. Hearts are a mystery. Sometimes we feel our heart is enduring one hard knock after another, as if it’s being hammered. We feel we can’t take yet another blow because we’re still stinging from the last one. But perhaps what’s really happening is Life – in its role as Divine Sculptor – is carving us with each purposeful blow of the hammer to reveal the love we are at our core that is concealed within the rough stone of ego. Each strike of the hammer or scrape of the chisel dislodges another chunk of our false, limited self, revealing the radiance within. This kind of perception allows us to handle loss and heartache with grace, for we realize we are getting closer to our true nature rather than believe we are losing something essential to our wholeness. Are we losing more of our self with each blow? Yes, but it’s the false self that masks the more authentic Self. The block of ego is the only thing being diminished – and refined. It’s happening in the process of liberating our True Self and our true beauty. We are not being diminished. We are magnificent masterpieces waiting to be revealed. Sculptures of light. Perhaps our hearts are not as fragile as we sometimes think after receiving another tough blow. Perhaps the only pieces we can lose are the pieces that are not essential to our wholeness and need to be chipped away because they block the exquisite expression of our inner light. Thy will be done. And may we trust the process and continue to shine. I have a friend who is a brilliant sculptor. My favorite of all her pieces is one that was born from great personal loss. Before I learned the story behind the sculpture, I felt its power and was drawn to it. All her work is amazing, but this particular masterpiece is infused with pure spirit. When I imagine the creative process through which she manifested the vision she knew was waiting to be revealed in that block of clay, I conclude that it must have been holy. And I imagine the creative process that is shaping each of us is every bit as holy. At times this year, I’ve felt more anguished than I can remember ever feeling in my life. But the whole time – even when I felt the heaviness deep down in my bones – I sensed that the hurt didn’t go very deep, that all was well at the core, and that I had a great opportunity to heal some longstanding patterns. I cried, prayed, and did some hard, honest work – and it still hurt so much! It was such a humbling experience! But then one day, I woke up and finally knew what it felt like to be healed. A shift had taken place, and I had to bow to the miraculous forces at work in my life – the blows that seemed to come from every direction at once and hurt so much at the time but served a greater purpose. So at the end of this very difficult year, I feel stronger and more peaceful than ever and consider 2015 a year of incredible growth and empowerment. The pieces that were chipped away were not integral to my wholeness. They were illusions, ego, and false perceptions and beliefs I organized my life around that needed to be dislodged. The perfect storm that tore through my life was a catalyst for pivotal growth and refinement. I learned so much, generated even more compassion, and activated some energy that had been latent all my life. And now when I look in the mirror (so to speak), I marvel at the beauty of the carvings thus far. Perhaps the final or biggest blows are not cruel or sad but ultimately are the most loving, skillful, and productive ones that finally and completely liberate the angel that has lived inside us all along: our true and most beautiful nature. I recall when my mom was dying, and her personality, ego, and form became so thin, allowing her formless essence to shine through more clearly and brightly than ever until it seemed she was pure essence. Even when we navigate circumstances that feel painful on a personal, human level, may our journey unfold against a spiritual backdrop that reminds us to be grateful for everything that allows our spirit to shine with greater clarity and brilliance.